Dynamo is curating an innovative experience in groove and musicality that transcends traditional band membership in favor of vibrant creative dialogue. Founded by piano/keys/bandleader Ryan Connors, Dynamo has become an imaginative, and ever-evolving, mix of jazz, rock, and funk with elements of soul and R&B. It’s most recent album, Celina, is named after a Northern Dallas town that has been especially generous and hospitable to the guys as they toured through. 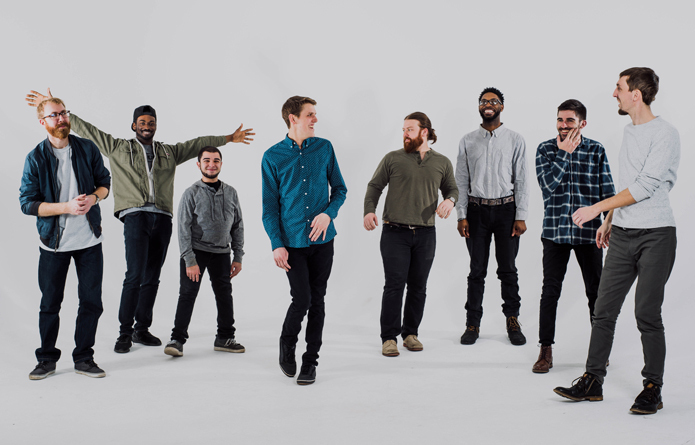 The current edition of Dynamo is Ryan, Josh Blaylock, keyboard, Kevin Gatzke, saxophones, Hank Born, electric guitar, Adam McPhail, electric guitar, Zachariah Witch, bass/synth bass, Ross McReynolds, drums/percussion, and Nate Felty, drums/percussion. The group’s vocalists in rotation include J Hoard, Emoni Wilkins and Melissa McMillan. Ryan and Josh are the group’s primary songwriters and aesthetic guiding lights. Dynamo has earned Nashville Industry Music Awards for “Album of the Year” and for best “Reggae/Funk/Fusion band.” Marquee tour and performance highlights include opening for the Robert Glasper Experiment, Derrick Hodge, and sharing bills with TAUK, Funky Knuckles, Becca Stevens, Sidewalk Chalk, Electric Kif, 4 Korners, Naughty Professor, FORQ, Shaun Martin, and Hunter Tones. In addition, Dynamo has toured with Bob Lanzetti, Progger, and Melissa McMillan.